Malwatte Valley Plantations PLC, Jaindi Exports Ltd., CBL Natural Foods Ltd., Leoste Tea, Adamjee Lukmanjee Exports Ltd., Deegayu Ayurvedic & Botanical Products Ltd. and Mikhail the Chef, featured by Sri Lanka Agricultural Sector Modernization Project; Ceylon Tea Land Ltd., Ceylon Tenny Tea Ltd., Jafferjee Brothers, Femrich Lanka Ltd., and Premier Natural Teas Ltd., supported by Sri Lanka Tea Board. The challenge of fine cooking based on Sri Lankan spices was taken by Jagath Chandrawansa, Managing Director of Leoste Tea, who presented an improvised master class on spicy tea brewing to the intrigued public surrounding the principal chef of the Sri Lankan pavilion, Mikhail Khlopov. On 20 September, the Ambassador and Sanja Jayatilleka attended a dinner dedicated to successful completion of the WorldFood 2018 Exhibition, hosted by Chathurika Perera, Second Secretary (Commerce) of the Embassy of Sri Lanka in Moscow. 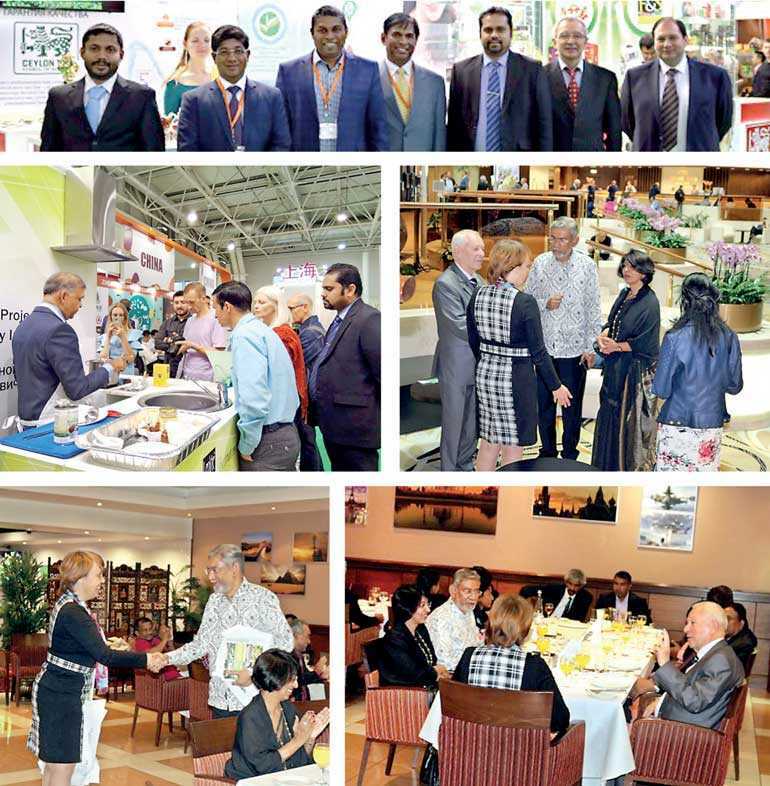 The event was attended by officials from Sri Lanka Agricultural Sector Modernisation Project, Sri Lanka National Pavilion Exhibitors and Russian Guests including Evgeny Stroganov, Chair of International Relation Committee, Russian Union of Goods Producers and Dr. Valeriya Arefieva, Director for International Cooperation of the Russian State Agricultural Academy named after Kliment Timiryaziev. Founded in 1864, the Timiryaziev Academy remains Russia’s leading agricultural education and research institution which offers a wide range of degree-oriented programs for international students as well as advanced professional training programs for specialists in all sectors of agriculture, from plant science and agronomics through agri-food sector management. The Academy is famous for having had two intellectual giants of the 20th century economics, Nikolai Kondratieff (‘long waves’ in economic cycles) and Alexander Chayanov on the faculty in the pre-WWII years. On this occasion, Dr. Valeriya Arefieva presented a book on the Timiryaziev Academy history to Dr. Jayatilleka.